oh bfl you rock my socks :D. after a rather downbeat spinning week, with the spoiled wensleydale and the mashed-up-by-dyeing cheviot, i realised that i hadn't spun my whole stash like i'd thought, and i had an untouched bag of "humbug" bfl tops lurking at the bottom of the basket. and what a joy to spin, soooo smooth, once again i just couldn't put it down. the top is this lovely badger striped mix and it spins up into a gorgeous tweedy mixture. i had a quick go at spinning from the fold, which was okay, but i couldn't be doing with joining in small handfuls every couple of minutes, really interrupted the flow. i also agree with yarnhead's opinion that you don't want chunks of colour from a stripey fibre, so i'm spinning it from the tips. the colours stay surprisingly separate as i spin, and combine beautifully when plied (for the first time i've done samples and i'm trying to keep to a reference thickness all the way through). i have split the tops because i wanted to get stretches with slightly different colour balances so they should ply interestingly, rather than even out too much. i spun half the bag (50g) in 3 hours last night. i am very proud of this one. it's got so much life and sheen and bounce. it's perfectly balanced and (i think) has just the right amount of twist in the single and the ply. there's some variation in size, but not lots, and only one or two spots where it's noticeably too thin. compared to my previous efforts it's really well plied - this time the singles didn't need as much tension, maybe because they sat on the spools overnight, so i tensioned each one over a separate hook. keeping them apart until they hit the twist made for much smoother plying. 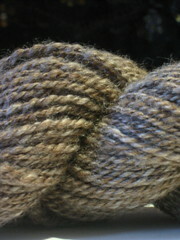 judging how much twist to put into the ply was a "how does it look/feel" judgement again, but helped by my plied sample. the stripes in the top made it really easy to check the twist using the technique from hjs studio - that the individual fibres in a balanced yarn run parallel to the yarn itself, if they're slanted one way or the other it needs more/less twist. it was reassuring to see that it agreed with the amount of twist i wanted to add based on the instincts i've built up so far.